Edible cookie dough recipes are delicious. In my opinion, cookie dough is better than the actual cookies. I was thrilled to learn how to make safe raw cookie dough to enjoy without worry. Thankfully, I was not the only one on the hunt for scrumptious cookie dough recipes. 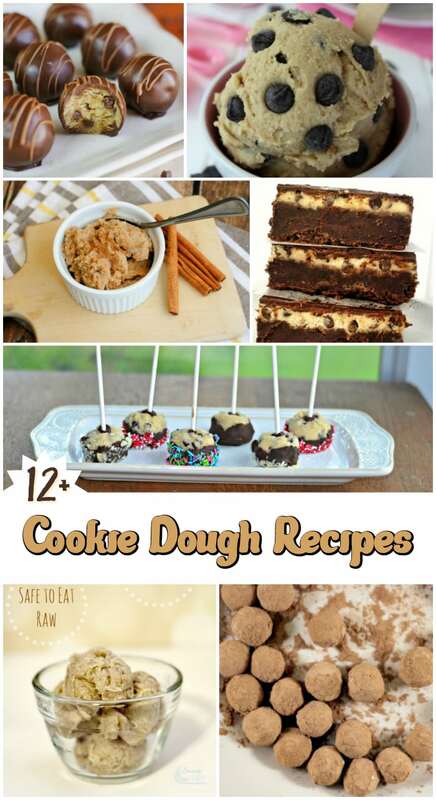 Thanks to my blogger friends, I was able to roundup several edible cookie dough recipes. Please visit each link to see their cookie dough creations. I have permission to share their posts and photos with you. I cannot wait to try each one. The recipes that are from our blog, I can tell you with confidence are super scrumptious. Snickerdoodle Cookie Dough from Frugal Mom Eh! Here’s one more addition for adults only: Snickerdoodle martini recipe. I used the truffles listed above to garnish the RumChata martini. Do you have any edible cookie dough recipes that you have tried and love? I’ve been eating raw cookie dough for 60 some years with no problem. I do like it better than some cooked cookies. I love recipes where it is safe to eat the dough! All of these recipes look delicious. I have to agree with you about cookie dough. I will eat thee dough and skip the cookies if possible! These lookl ike a great idea, and something I would enjoy a whole lot! These are all delicious recipes, will definitely try these and pin for later.